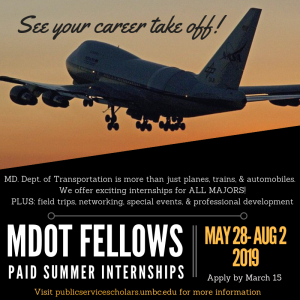 The Maryland Department of Transportation (MDOT) Fellows Program exposes Maryland’s college students to careers in the state sector within Maryland’s integrative transportation system. Fellows of all majors are placed in full-time assignments in one of MDOT’s units, mentored by senior-level administrators. With the knowledge gained at their placements, and through seminars, trips, and networking, fellows research and create a proposal to solve a transportation challenge. The program is administered by the Shriver Center in conjunction with the Office of the Secretary of Transportation. Fellows are paid a stipend of $3,500 for their participation in the program. Fellows put their knowledge and skills into practice, researching and proposing a solution to a transportation challenge.